Major depressive disorder (MDD) is a common mental disorder worldwide; however, little is known about its etiology. It is well known that levels of certain trace elements are associated with the pathogenesis of some diseases. Accordingly, this study aims to evaluate the effect of trace elements and vitamins in the etiology of MDD. In this case–control study, sixty men patients with MDD and sixty, age and gender matched, control subjects were examined. Serum levels of Cu, Zn, Ni, Cr, Mn, Mg, and Al were determined by atomic absorption spectrometry as well as serum levels of vitamins E and A were determined using high-performance liquid chromatography. The results revealed that there were significantly higher levels (p < 0.001) of Cu, Cr, and Al in patients sera compared with control. While there were significantly lower levels (p < 0.001) of Zn, Ni, Mn, Mg, vitamin E, and vitamin A in MDD patients as compared with control. In addition, high Cu/Zn ratio (p < 0.05) was observed with the depressive disorder patients. The present study highlights some main indications: a significant relationship between the disturbances of element levels and vitamins (E and A) with MDD. Cu and Zn seemed to have a crucial role in understanding the pathogenesis of depressive disorders, where Cu/Zn ratio could have an important role in the diagnosis and monitoring of MDD. Moreover, the results suggest that the reduction in the antioxidant vitamin E leads to increased risk of MDD. 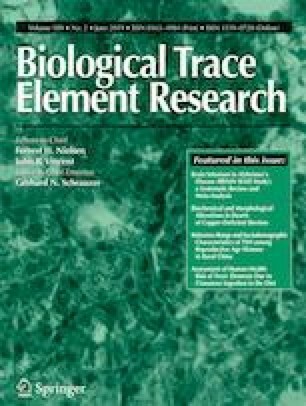 Finally, more studies on using trace element supplementation would be suggested to clarify their effect, in order to improve the therapy of MDD. The authors would like to thank Mustansiriyah University (www.uomustansiriyah.edu.iq), Baghdad, Iraq, for its support in the present work. All procedures performed in studies involving human participants were in accordance with the ethical standards of the research committee of Mustansiriyah University and with the 1964 Helsinki declaration and its later amendments or comparable ethical standards.